After the 1969 Pima County Fair at Tucson, I went back out on the road with my two grind shows- Wild Cargo and Animal Oddities. I took Sue Perryman with me, and we played around southern Arizona and New Mexico. We 'promoted" some help, went back by Catalina and picked up the 10-in-1, and set up at the Flagstaff Fair over the Fourth of July. Then we went on to Cheyenne, Wyoming, Frontier Days. We took a chance and booked all three of the shows at the Pueblo, Colorado, State Fair. Help was hard to come by: we even offered jobs to hitchhikers! Somehow we got thru O.K. with all three shows. And we did it again at the New Mexico State Fair at Albuquerque, which turned out to be very good financially for us. But this was very hard work and we closed the 10-in-1 with this fair. Sue, I, and another fellow then played a few small late fairs in New Mexico and Texas, and then we took all the equipment back to winter quarters.....After a quiet winter with Lee in Catalina, I was ready to go back on the road. I booked several early fairs in south Texas, and Sue came in and we left with three grind shows (Wild Cargo; Animal Oddities; and the Two-Headed Baby), and the 10-in-1 on Wednesday, Jan. 21, 1970. We opened in Edinburgh, Texas, on Jan. 25. We played eight celebrations with Heart of America Shows. As I said before, help was getting harder and harder to get; especially good help. I had Sue; Bill Unks, and Jim Hart, who had worked for me on and off for several years as a tattoo artist, and would help on the inside of the 10-in-1 when I needed it. So I took a chance and booked the 10-in-1 and two of the grind shows with the Art B. Thomas Shows, opening May 1 in Kansas City, Missouri. We played five spots with them. It wasn't the greatest route for the 10-in-1, but we were holding our own with the grind shows. At Sioux Falls, South Dakota, Bill Unks and I had an altercation, and he left. And Hart wasn't doing any business with the tattoo joint, so he left! Thomas Shows was going into Canada and I wasn't ready for that route again! Sue and I, with the only employee we still had, departed Thomas Shows and joined Central States Shows for four spots in Kansas. Then we joined Frazier's Shows combined with Gene Love's Show at Cheyenne, Wyoming for Frontier Days. (I had to pay each owner a percentage!) Jim Hart came back, and we picked up local help, and did O.K. there and at Casper, Wyoming, with the 10-in-1 and grind shows. Then on to Billings, Montana, State Fair, where I was able to get real sideshow help by running an ad in the Billboard. The previous spring I had booked the National Exposition in Vancouver, Canada, and we went on to there after Billings. We had the 10-in-1; Wild Cargo Show; and a small freak animal show. Back in Cheyenne there had been a man with a little frame tent with a five-legged sheep inside. The sign outside just said;"5-Legged Sheep Inside". He wasn't doing any business, so I offered him Fifty Dollars for the sheep, and he took it! I added "ALIVE" to the sign, and put the sheep in with the Elephant-Skinned Dogs and stuffed freak animals I had. I had that sheep for several years, until she died in a snowstorm in Silver City, New Mexico, in 1975. When crossing the border into Canada, I discovered the sheep wouldn't be allowed in; and I had to leave her in a pen at customs in Blaine, Washington, until we returned to the states. They did take good care of her until we could pick her up. We opened in Vancouver August 22; closed September 7- the biggest and best run we ever had- we grossed as much there as the whole season before! I had seven sideshow people on the payroll, plus two Canadian girls. I had Lee fly up from Catalina and join us- she enjoyed the three-week run, doing her snake act and keeping the girls in line. When we got back to winter quarters I bought her a new car as a bonus for helping out. But I had a lot of problems with a couple of the acts, particularly the sword-swallower. He just couldn't keep sober! I had to keep him in a hotel the last half of the fair- I couldn't send him back as he was on my manifest! When we came back to the states, as soon as I got him across the border in Blaine, I gave him some get-away money and booted him out! And picked up the sheep, who was glad to see us. I said at the time I didn't want any more to do with the sideshow! I took it home; paid off the help; and never opened the Circus of the Fantastic again. I sold it a couple of years later.....The good thing about the grind shows I had (animals; snakes; two-headed baby): none of the performers were late for show time; or drunk; or asking for draws on salary at all hours of the day or night! And all took baths willingly! .....I'm not going into detail at this time about my next seventeen years in the business, other than to say I built up the freak animal show to one of the largest touring the U.S.; and played with some of the bigger carnivals: Century 21; Goodings Million Dollar Midway, and others. I did bring out a new sideshow for the 1978 season on Century 21, but it was still just as hard to get help. I only showed eight fairs with it; and the animal show always out-grossed it! In 1971, Sue and I were in south Texas again, playing around with Lee Hayward Shows. On April 24, 1971, in Bryan, Texas, Sue gave birth to our daughter, Connie Sue. Sue and I had become an item a year prior, and it was, for me, a very hard thing to write Lee and tell her about this- but in time everything worked out. Lee even kept Connie in winter quarters when she was five and six to go to school. We took her on the road when she was seven, that was 1978, when we had a new 10-in-1 out on Century 21 Shows. She worked in the sideshow for every performance, as the girl sawed in two by the Saber Saw illusion, and walked up and down on the ladder of sharp machetes as the "Indestructible Girl". The three of us were on the road together thru 1982. That year I sold the big animals- five-legged cow; five- legged sheep (the second one I'd owned); llama, and a couple of others, as they were becomming a bit too much too care for. I intended to just keep small animals and pickled and stuffed ones. Ironically enough, when I sold the animals to well-known showman Bobby Reynolds, as part of the deal I took in trade a complete pony ride with eight ponies- the live kind! More big animals again! But Sue loved horses and wanted the ponies. She wanted to go on her own, so she left me. I gave her our motor home and the pony ride. She still works ponies, travelling throughout the southwest during the carnival season, and lives winters with her partner on their small ranch in sutheast Arizona. They raise ponies there. Connie stayed with me the next five years and travelled on the road summers as my ticket seller. Winters she went to school in Tucson. When I was ready to go out for the 1988 season, Connie announced she'd had enough, and wasn't going out on the road again. She was seventeen and in love with a local boy! I didn't want to go out alone, and as I was now in my sixties, I decided to retire. 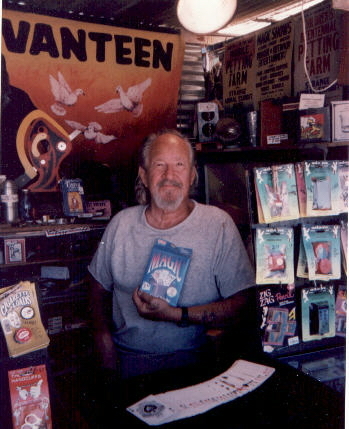 I started a small magic and novelty business, selling on a steady basis at a large year-round day and night flea market in Tucson.....In 1990 I met a young woman who had a cactus business at the same flea market. She was an artist, as well, exhibiting paintings and sculptures at galleries around Tucson. In time we became an item, and in 1992 she moved out to Catalina to live with me. She has been my constant companion ever since. An unusual coincidence- she was born and raised in San Bernardino, California. Every year as a kid she went with her family to te National Orange Show there. She remembers seeing me there, in either '68 or '69- because she remembers the Atomic Girl illusion, and the suave magician preforming it! During our first couple years together, the atmosphere of the flea market changed- it no longer attracted customers for our types of businesses. Since winter quarters was zoned for business, we just took our businesses home and opened them there. My companion has a small cactus nursery, and a gallery to exhibit her paintings and wood sculpture. She is known as "Turtle Woman; Artist and Gardener". And I have a small magic shop, mostly as a hobby and to entertain the local kids, in a corner of one greenhouse. I do perform occasionally at local events.As of this writing, I have just turned 71 years young! On my birthday Connie, and her daughter Ashley, brought me a big cake! Connie has always stayed around the Tucson area, and visits me regularly. My granddaughter Ashley will be eight years old in February.....I do not type- this site was created by me dictating what I wanted written to Turtle Woman, who entered my words. She also designed this site. I want to thank Tripod, who furnished this space- they made it possible for me to "publish" my memoirs and have more people then I ever thought possible read them. And WebTV for getting me on the internet in the first place! Here I am in my little home magic shop. If you're ever in the Tucson area, stop by! This is NOT the end...for more on my life as an Outdoor Showman, check my "Tidbits" page and my "Grind Shows" page. The Early Years:: my start in magic. NEXT: Tidbits from along the way, and other stuff I just plain forgot!